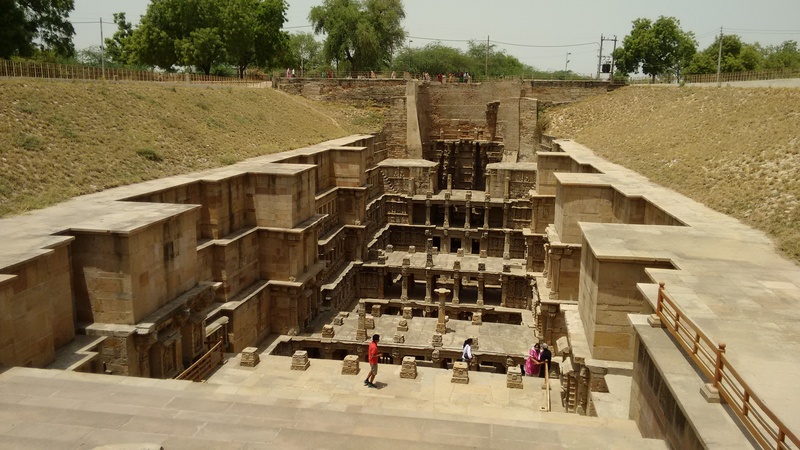 Rani ki Vav or queen’s stepwell, Patan. 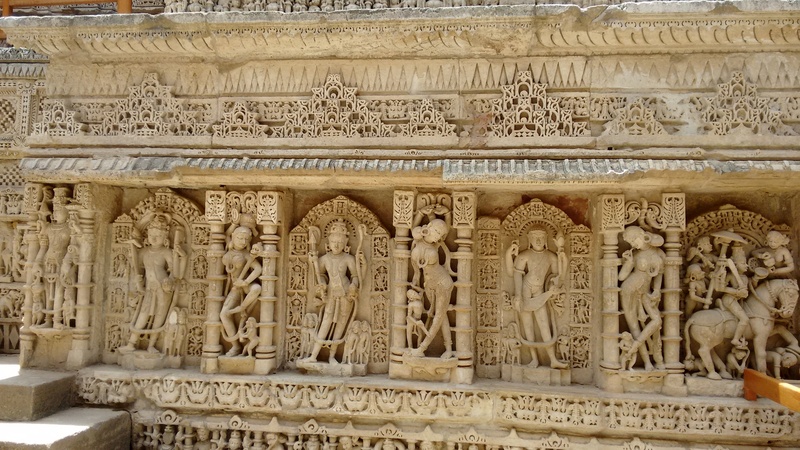 Beautiful sculptures on the walls. Most of the sculptures are in good shape. 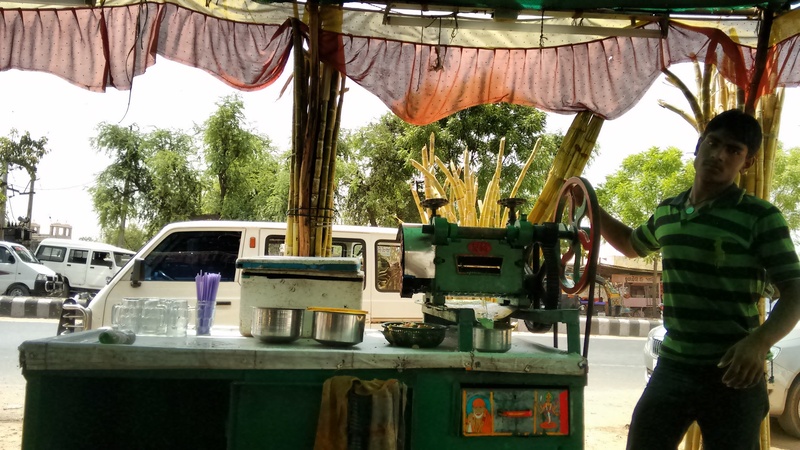 Sugarcane juice break at Mehsana outskirts. Last Saturday at 9 am, we headed out in the 43 C heat to a place located 125 kms north of Ahmedabad. 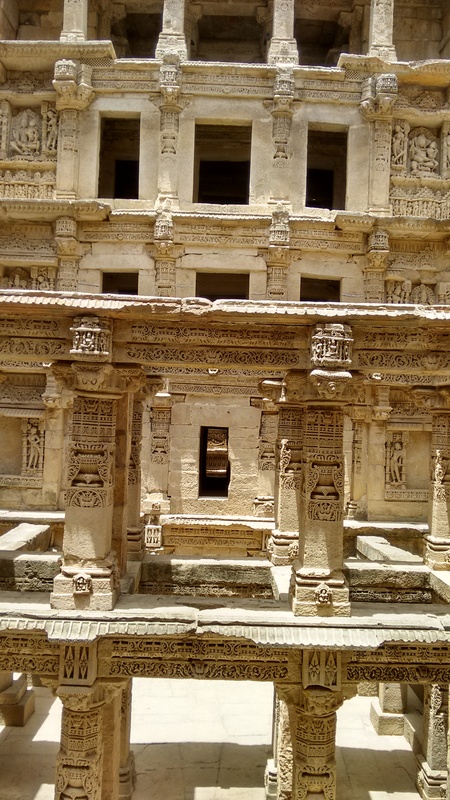 Our destination – Patan; world renowned for 2 things – a stepwell and the Patola style of dyeing and weaving textiles. The same can’t be said for the environment – arid, dry and dusty. Half way, as a respite, we took a sugarcane juice break on the outskirts of Mehsana. Arriving at the stepwell compound at 12 pm, we found it very well maintained. 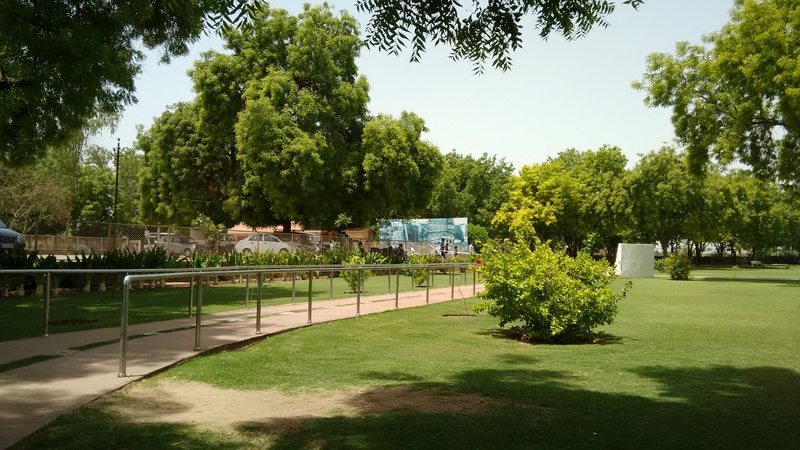 Green manicured lawns, neem trees planted at regular intervals and metal benches below them. The funny thing was that there were a lot of families roaming in this unbearable heat as if it was a cool winter evening! 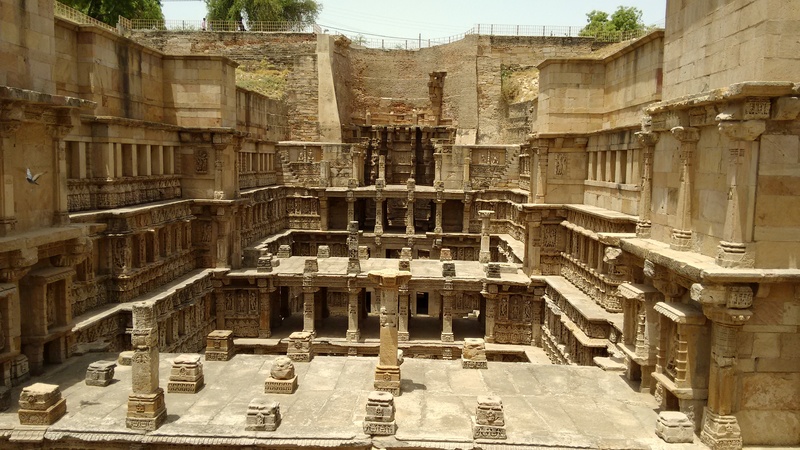 The 1,000 year old stepwell Rani ki Vav (literally meaning Queen’s stepwell) has been declared a UNESCO World Heritage Site. 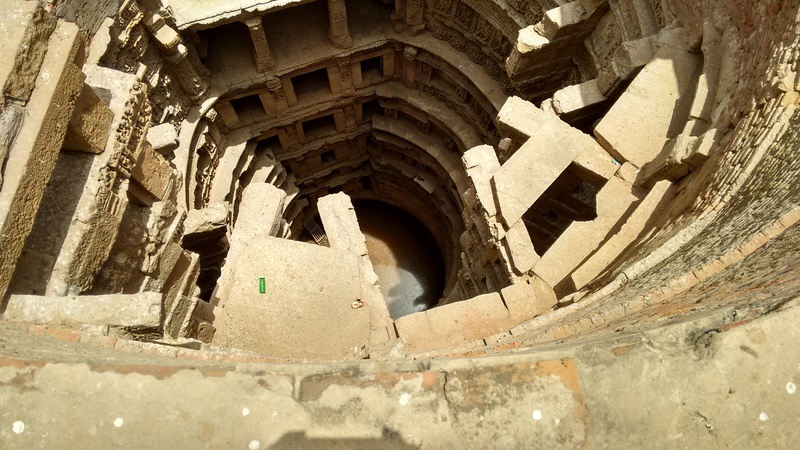 7-storeyed with very beautiful sculptures, this well was built by the queen Udayamati of the Solanki dynasty in memory of her husband. It was completely forgotten and lay hidden for a long time till an earthquake in 1960s revealed it again. 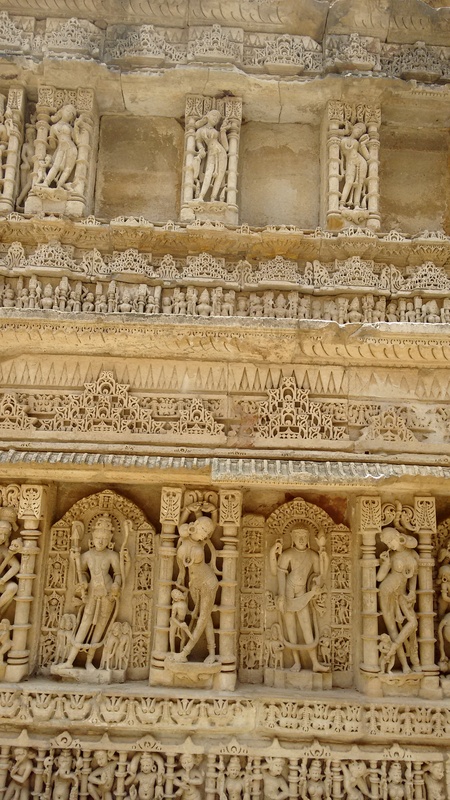 Probably due to this, the sculptures are in such good condition. Post that, we wanted to check out the Patola. We found a small museum called the Patola House, which had a few exhibits and photographs. The Patola is an extremely beautiful and difficult style of dyeing and weaving textiles. To this day, people from across the world come to learn the art. (We found samples of work by artisans from Indonesia, Japan, Spain and Netherlands.) At one time, there were 700+ families involved in creating these garments. As with many traditional arts, this one too is dying. Now only the Salvi family continues the work. As we came out of the museum, the intensity of the hot winds increased and the roads emptied. I could feel the heat taking its toll on me. 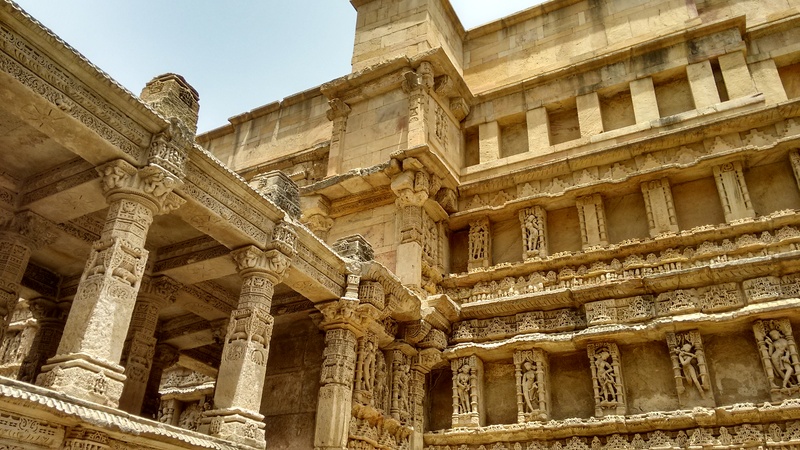 We had a quick meal in Mehsana and returned late afternoon to Ahmedabad. As soon as I reached, I switched ON the AC, thanked God, and slept off dreaming of wells, textiles and arid lands. 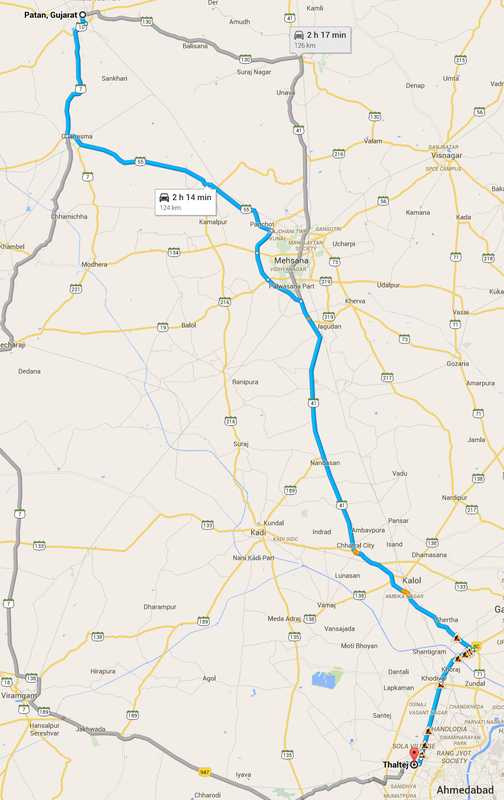 The route we took, courtesy Google Maps. Can you see the sleeping Vishnu in the centre? View from the top. Not much water. Am scheduled to visit Patan on the 20th of this month . Loved reading through and your pictures are wonderful. Hi Priyanka, thanks! Do try and meet up with the family which does the famed dyeing work if possible.